Elizabeth Kadetsky is not afraid of venturing into the varied ways of storytelling or to different parts of the world. She is the author of a memoir First There Is a Mountain (2004), a story collection The Poison that Purifies You (2014), and a novella On the Island at the Center of the Center of the World (2015). An associate professor of fiction and nonfiction at Penn State, Kadetsky is publishing her first graphic essay in Punctuate. In this interview, she shares her thoughts and experiences about writing in diverse genres; traveling; and yoga. 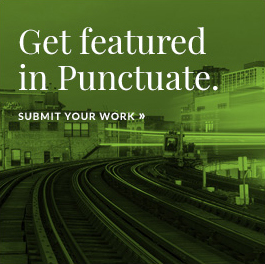 Juliana Ravelli: Your work in this month’s issue of Punctuate. is your first published comic, right? When did you start writing and designing comic and graphic essays? How and when did you start working on this form? Elizabeth Kadetsky: A few years back, I wanted to get back into drawing, and I had a crazy idea to revisit and write about this place where I’d studied art in Greenwich Village as a teenager with my mother. Well, that idea didn’t take off because I realized that it would be much cheaper to audit a drawing class [where I teach] at my university, Penn State, instead. My teacher turned out to be a wonderful artist and graduate student from China who drew Manga. I showed her some sketches that I’d been doing from photographs, images of family members with text scrawled in the white spaces, and she suggested that I work on a comic. I had an aha! moment: I shouldn’t be writing about drawing, I should be drawing (and writing) that story about Greenwich Village and my mother. I’ve been working on that graphic memoir ever since—I had no idea the difficulty of the task I’d set for myself. The other thing I’d recently dove into without ever accepting its difficulty was motherhood. Suddenly I had long stretches of time with my baby during which I didn’t have the presence of mind to practice my usual craft, writing. I was suffering sleep deprivation and could barely string together sentences—I think it was a fairly normal postpartum, a-verbal, semi-psychosis. It was as if language had left me. But I was able to draw and paint. I painted birds over and over, and number cards to photograph with my baby to mark the monthly anniversaries of his birth, which was four and a half years ago. Living with a young child makes your world more visual. Language becomes more elemental—you see the world through the eyes of someone glimpsing it for the first time. As my son grew older, I encountered the rich text/image world of children’s literature and wonderful artist-writers such as Oliver Jeffers and Molly Bang. Now my son and I are reading Tintin and the original Batman’s. I love existing in the space and flow of visual art. The mind attuned to visual art is so different from the one that writes—it is less linear; it requires long pauses; it doesn’t require one to formulate a literal idea and keep it in the head over a long stretch. I’d always loved the idea of a non-verbal mind space, and over the years, I had used drawing and drawing classes as a kind of meditation and escape from regular life. As a teen, drawing had been my first love, but I’d shied from art school. Today it’s back in style thanks to comics. JR: Could you tell us about how you came up with the idea for your piece in Punctuate.? EK: I was participating in a panel on text/image memoir at the NonFictioNOW conference, and I started “graphic note-taking” at the other panels and talks. I’d seen people doing this earlier in the year when I attended the Comics and Medicine Conference at the Comics Studies Society in White River Junction, Vermont. There, the organizers set aside seats at each panel for “graphic note-takers,” and there was a hashtag for their uploads. The conference also had an official graphic note-taker. When I looked over my notes from NonFictioNOW, I realized I should publish some, especially since it would give me a break from my longer project–not to mention feel good to finish something. JR: What are the challenges of a comic/graphic essay? How, for instance, do you play with conciseness, drawings, text, and the arrangement of these elements on the page? EK: It’s its own form, that’s for sure. There’s always so much less room for text than I expect there to be; the prose writer has to condense beyond comfort. Of course, if I don’t want to condense, I can always add another page and spread out. The give-and-take between writing and drawing is fun and dynamic. Adding another page because there’s not enough room for the text must be the craft equivalent of writing oneself into a corner and then drawing oneself out of it. Shifting brain-modes from writing to drawing and then back again provides a healthy mental calisthenics. JR: You worked as a journalist, and you write fiction, personal essays, and comic/graphic essays. What motivates you to venture into all these different genres? EK: It’s been intuitive, but I do really admire other artists who constantly shift modes, and are open to the modes that are getting the most attention at whatever moment. If you have a story to tell, the goal is to find an audience for that story. The mainstream publishing industry has gone bankrupt a dozen times and in a dozen different ways since I started publishing my writing. It’s terrible to feel trapped in the idea that there is only one outlet for one’s creativity. Writers have historically been at the mercy of publishing and production trends. So, I admire writer friends who have gone into film or even TV. If TV is experiencing a renaissance, why not apply your craft in that field, where you’ll encounter other inspiring artists and gain support for your most creative output? Not that I’m going into TV. But in a weird way comics feel very vital right now—I have no qualms about trying to hop on that train. JR: How do the different experiences that you have in writing influence one another? EK: Journalism teaches pragmatism—the clear sentence, the chronological storyline, economy of prose, writing on deadline, overcoming perfectionism, developing a thick skin for feedback. It’s a great training for any writer. Working visually teaches metaphor. In a comic, when you want to depict your character as birdlike, you draw her as a bird. It’s kind of obvious, but getting your writer brain to think of metaphor as real pushes your imagination. Even in nonfiction, one can probably take greater creative liberties than one thinks. The blank canvas is unencumbered—one has to think in several dimensions, and directions, at once—not just left to right, up and down, and within a palette of just 26 letters. If I think of my character as a bird, and I mean in text, why shouldn’t I get her squawking on the page? JR: Traveling is a huge part of your life, right? In which moment did you find out that you wanted to know the world? And what are your memories about your first trip abroad? When did it happen? EK: That is such a great question! It happened when I was nineteen and I was majoring in Latin American Studies. I got it in my head that I wanted to go to Cuba because of some of the films and writing in my classes. I found a program to send me there for free—it was sponsored by the American Friends Service Committee, a Quaker organization—and I was chosen as one of a team of two Canadians and two US citizens to act as mediators between Marxists and Christians out in the fields, planting yucca trees. Someday I will go back and rewrite (or draw) the diary I kept from that one-month trip. It was a life-altering, coming-of-age journey, in part because Communism had so completely shaped the culture of that place that there was hardly any common ground between my hosts and me. At the time, the US embargo on Cuba was total and included a news blackout going both ways. As it turned out, I knew nothing about the lives of the people there, and they knew nothing about mine—there had been a misinformation campaign on both ends. And yet, there was music, dancing, and singing bringing us together, things that transcended politics. I remember coming home and having to break up with my boyfriend at the time because I’d changed so much as a person. Then, for several months, I was very depressed, wanting to get back to that feeling of living life so fully moment to moment, having heated discussions about every little thing, questioning and debating everything down to one’s most minute daily habits. JR: Many of your trips are connected to your work, your writing. What is the difference between traveling for writing and traveling as a tourist? Is there a place that you have been to but haven’t used in your writing? EK: I love this question, too, because it forces me to take stock. As a writer, one must always be working, but, in life, sometimes the imagination and the urge to document shuts down—from exhaustion, or overload. I can’t remember ever taking a trip and not feeling that I had to come away with something to say and write from it, but in reality, many of my work and vacation trips have yielded nothing aside from greater wisdom (one hopes). I can’t even say I gained relaxation because it’s so stressful to feel one should be writing or interviewing instead of sitting on that beach. I think back on trips I took to Egypt, Morocco, Israel, and Spain as not having been particularly fruitful even though they were meant to be. The work of the writer who travels, really, is to shake things up in one’s mind. Obviously, the outsider is not going to be the last word on any place she or he encounters. I remember reading Thomas Pynchon’s V, set in Malta, one time when I was feeling very stuck while spending the summer in Nicaragua working and presumably writing my senior thesis for college. Later, I published a novella set in Malta, so perhaps it wasn’t a waste. Recently I recovered an old photo of myself reading The Brothers Karamazov in a hotel in Spain during a trip where I felt completely aimless, but Dostoyevsky taught me so much as a writer, and when else would I have had time to read him? I read David Foster Wallace’s Infinite Jest in France, and that book was life changing for me. JR: Aside from the stories themselves (characters, settings, etc. ), in what other ways does traveling influence your craft? EK: Traveling ratchets up the desperation impulse, at least for me. The finances of it all can be terrifying. Most of my international trips have been seat-of-the-pants—funding the plane fare by subletting my apartment, living on the largesse of a boyfriend’s language-study grant, stringing together freelance magazine assignments and arts residency fellowships. Even when I had the Fulbright grant to India to study and write about yoga, I had no home, job, or bank account to soften the landing when I came home. That feeling of living on the edge can either make things feel exaggerated with meaning and importance, or simply crushing. Luckily the former describes most of my trips. I would say that each piece of successful writing that I’ve come away with from abroad bestows upon its protagonist either that desperation (in fiction), or an all-consuming and worry-obliterating single-mindedness and focus on a topic (in nonfiction). JR: You lived a year in India working with Yogi BKS Iyengar and from this experience you wrote First There is a Mountain. In which ways do you apply yoga to your craft? EK: Studying and researching yoga in India taught me to think of yoga as a kind of hygiene, a practical approach to living. A man I met at the Krishnamurthi Foundation in Chennai put it this way: “Yoga is like brushing your teeth. You do it every day. If you don’t do it one day, then you don’t eat that day.” Lately I do the yoga poses less than before because of injuries, but I exercise and meditate pretty much daily. What I learned about focus and concentration from yoga applies to writing. And let’s face it, yoga, as we know it, even the Indian version, is an amalgam of dozens of Eastern and Western philosophies and ancient and modern practices, including psychotherapy and Jack Lalanne fitness. It’s all really a mash-up. So, yoga, mindfulness, techniques from cognitive behavioral therapy—call them what you like, on a good day, they completely shape how I live and write and work. Concretely, they help me attain the cognitive sharpness and flexibility to be creative—to make mental leaps, to silence the self-editor within, to take risks. JR: What are your next literary and travel adventures? EK: Funny you should ask! I recently found out that I was awarded my second Fulbright research grant to India for the 2019–2020 school year. The award is to research a novel dealing with the politics of cultural patrimony surrounding antiquities ownership and preservation. I don’t think anyone would mind if I came away with comics reporting on the topic. Whoops! Don’t tell anyone I said that. I’m definitely bringing my drawing pads, pencils, erasers, India ink, and brushes—and Photoshop. I hope I can find a scanner. Juliana Ravelli is the Assistant Managing Editor for Punctuate. A Nonfiction Magazine. Elizabeth Kadetsky is the author of a memoir (First There Is a Mountain, Little Brown), a story collection (The Poison that Purifies You, C&R Press) and a novella (On the Island at the Center of the Center of the World, Nouvella). Her fiction has been included in the Pushcart Prize, Best New American Voices, and in Love Stories For Turbulent Times — a best of the previous 25 years of the Pushcart Prize, and her personal essays have appeared in the New York Times, Antioch Review, and many other venues. 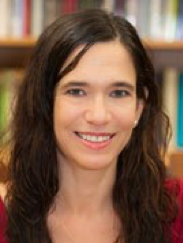 She is nonfiction editor at New England Review and associate professor of creative writing at Penn State University. This is her first published comic.